In post 28, I described a model of an ideal gas atmosphere with no latent heat (no water vapor for that matter) with radiative heating/cooling a function of temperature only, with no seasonal cycle, and with linear drag near the surface relaxing the flow back to zero in a rotating reference frame (this is how the atmosphere knows that it is rotating). The lower boundary condition is a homogeneous spherical surface (no mountains, no continents, no oceans). I think of this model as part of a hierarchy of models of increasing complexity so with an admiring reference to the way in which biological research is organizing around “model” organisms I refer to this as the “fruit fly” model. 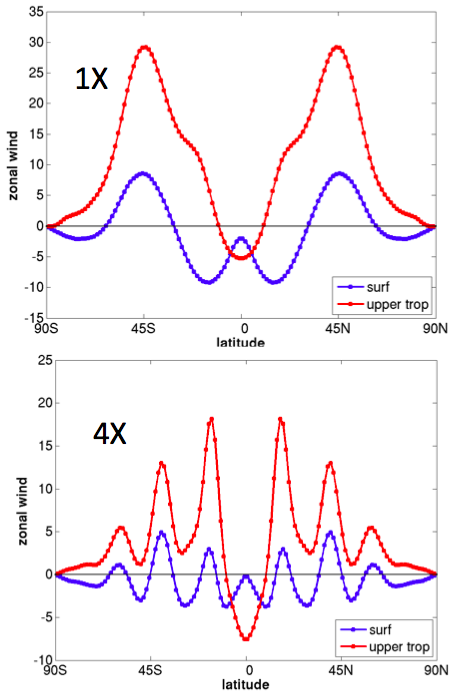 In that post, I mentioned that the surface westerlies move polewards as the rotation rate is decreased. Poleward movement of the westerlies is what we expect in a warming world. There is no guarantee that what we learn by varying the rotation rate in this very controlled setting will be directly relevant to that problem but I think it does stress our understanding in interesting ways . The animation above compares the evolution of the zonal (east-west) component of the wind in the upper troposphere when using the Earth’s rotation rate with the evolution you get with 4 times the Earth’s rotation rate. The striking behavior that one sees with rapid enough rotation is the appearance of multiple jets in each hemisphere. With 4 times the rotation rate in this particular case, there are three eastward jets in each hemisphere, with the most poleward jet struggling to get organized. You can get a sense form the animations that the eddies are a lot smaller in the more rapidly rotating case. Our understanding is that the ratio of the size of the eddies to the size of planet is critical for the formation of multiple jets. The way in which rotation influences the eddy size is a fascinating issue with a long history, but for this post we can just accept the result that eddy size decreases with increasing rotation rate. We find that if there is room for a lot of eddies between the equator and the pole you get multiple jets. The eddies on Earth are too big and don’t have enough room to create more than one jet. You get similar results by increasing the radius of the planet and holding the rotation rate fixed. Starting point #1 (Baroclinic instability): The dominant eddies in the troposphere, responsible for the structure of midlatitude weather on Earth, are generated by what we refer to as baroclinic instability. These eddies work to reduce the north-south temperature gradient and, speaking a bit loosely, they extract their energy from that gradient. But this temperature gradient is associated through “thermal wind balance” — that is, geostrophic balance plus hydrostatic balance – with an increase of the eastward winds with height. When these eddies grow and reduce the north-south temperature gradient they also reduce the vertical gradient of these zonal winds — that is, they transport eastward momentum from the upper troposphere down to the lower troposphere,producing surface westerlies in the process and providing a drag on the upper level flow. But if there is a hint of a jet-like structure in the upper tropospheric winds to begin with, the eddies importantly prefer to exert this drag on the sides of the jet and not at its center, so they have a propensity to create jets. The resulting upper tropospheric jets also act as waveguides for the eddies, helping to create a coherent jet/storm track structure that has a meridional width related to the characteristic size of the eddies. See Panetta, 1993. Starting point #2 (Two-dimensional turbulence): Two-dimensional flows tend to cascade energy to larger scales, rather than smaller scales as in the more familiar three-dimensional turbulence. On a rotating sphere this energy is channeled into zonal jets with a width determined by the energy level of the eddies in the flow, as described in a seminal paper by Rhines 1975. These multiple jet flows obviously bring to mind the circulation of Jupiter and the other gas giant planets. There are also important differences. For example, no long-lived Great Red Spot-like vortex forms in this simulation. And there is an eastward jet at the equator on Jupiter, a feature we refer to as superrotation, that is not present in this simulation either. But we shouldn’t expect to simulate everything in the Jovian atmosphere by changing one parameter in an Earth-like model! (You move further in the Jovian direction by reducing the strength of the drag exerted by the surface in this model.) There are many reviews of Jovian meteorology — one that I like is Vasavada and Showman 1995. A former colleague of ours at GFDL, Gareth Williams, passed away recently. Gareth was fascinated by the circulation of Jupiter’s atmosphere and returned to it repeatedly throughout his research career. Before he turned to this problem, theories were centered on the possibility that the jets and banded structure were superficial manifestations of very deep convective cells resembling concentric cylinders, driven by heat release in the interior. Starting in the 1970’s, Gareth argued for a picture resembling terrestrial meteorology with the multiple jet structure set by the dynamics of a thin spherical shell of fluid, as discussed above — e.g., 1978, 1979, 1982, 2002, 2003. Precisely how these two ideas fit together is still discussed (the jets can be deep even though driven from the surface) but there is little doubt that the surface-driven perspective is a big part of the story. This post is a small tribute to Gareth’s memory. I am curious to see what the meridional circulation pattern would be like in the 4X rotation rate case, except that the tropical Hadley circulation must become narrower. Thank you, Isaac. Also thanks to Tapio for the reference which I just read through and liked a lot, particularly the discussion on the angular momentum balance. Possibly the angular momentum balance could be another starting point or perspective as in Isaac’s 2000 WHOI GFD lecture. Isaac said in your post that relating the different perspectives ,such as baroclinic instability and 2D turbulence, is challenging. I am interested to know more about your thinking on the challenge. Possibly the vertical difference of the jet scale (Rhines scale) be a part of the challenge? There are plots of meridional circulations in such simulations, e.g., in this paper, and a sketch and discussion of how they look on a deep planet like Jupiter in this paper.